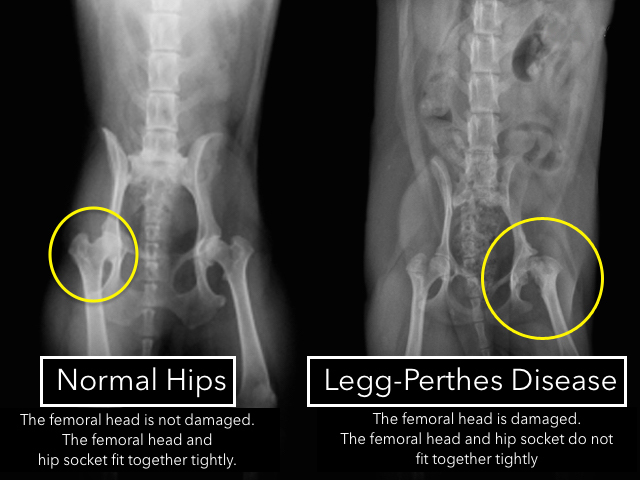 This is another disease involving the hip joint and is seen in many of the toy breeds. In this disease, the blood supply to the head of the femur (the large rear leg bone) gets compromised and the head of the femur that connects to the pelvis starts to disintegrate. This usually is first noticeable in puppies 4 to 6 months of age as they start limping and getting muscle atrophy of the leg. The surgery to help the puppy involves cutting the diseased head off of the femur so it is no longer attached to the pelvis. Scar tissue comes in and forms a “false joint” and the puppy is usually pain free.